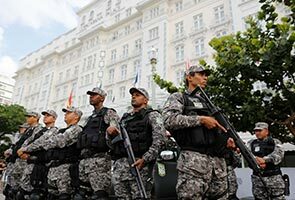 SAO PAULO: Some 26,000 police and soldiers will provide security Sunday for the World Cup final in Rio between Argentina and Germany, the Brazilian justice minister said Thursday. After a meeting with FIFA and the federal government in Rio, minister Jose Eduardo Cardozo said that force has not been increased despite a flood of Argentines heading to Rio for the final. Rather, this is the force originally planned for the final, he said. Cardozo also noted Brazil's shocking exit in a 7-1 drubbing by Germany in the semi-finals.